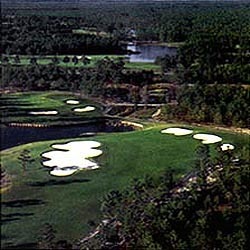 These courses are two new designs by Clyde Johnston, located in the Northern section of Myrtle Beach on the North Carolina border. The North Course features a Scottish-American theme with higher elevations and broad, open spaces punctuated with pines. The courses feature natural streams running through them with an excellent assortment of par five holes. The South Course is more traditional in design, thickly treed, with Johnston making full use of the land's natural elevations. Both of the courses are real challenges but fair tests for golfers providing they choose the proper tees to play from. If not, look out! !